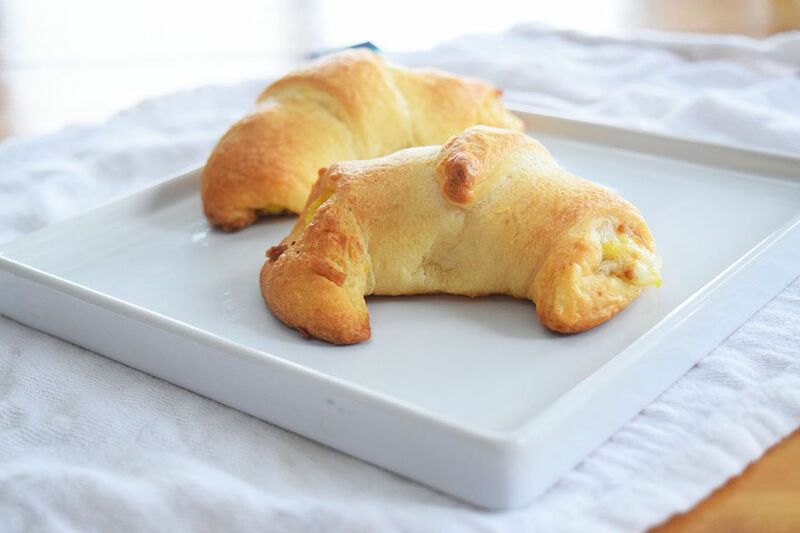 Crescent rolls are the holy grail of bread. They come in a can, are fluffy and delicious and are ready in minutes. They are even better when they are stuffed with bacon, scrambled eggs, and cheddar cheese. Although making recipes completely from scratch is always delicious, there is something sacred and special about crescent rolls. It's probably because so many people enjoy them during the holidays and they hold a special place in many people's hearts! You can't go wrong with using puff pastry or a homemade dough for this recipe either! These are beautiful little breakfast sandwiches without any of the over the edge of the bread spillage. Since they're all rolled up they are easy to grab and eat. It's the perfect quick and easy breakfast. It's easy to make a big batch of these for Christmas morning or for a brunch. You can also make a large batch and then freeze them and reheat them when you are ready to eat! You can stuff them with sausage instead of bacon or other kinds of cheese instead of cheddar. You can also skip the scrambled eggs if you want to and just do bacon and cheese. If you like it spicy you can add a little hot sauce after they are finished. You can also brush the tops of the rolls with melted butter for a little extra buttery flavor! Heat the tablespoon of butter in an omelet pan. Whisk together the eggs and salt and pepper. Pour the eggs into the omelet pan and scramble until completely cooked. A little underdone is ok since it will be cooked again in the rolls. Cook the bacon in the oven or in a pan until crispy. Drain the bacon and let it cool. Chop the bacon finely and set aside. Unroll the crescent dough and separate the triangles. Place a tablespoon of the egg mixture, and a sprinkle of bacon and cheese over the egg. Roll up the triangle as you would a regular crescent roll. Place the roll on an un-greased baking sheet. Repeat with the remaining dough. Let them cool slightly and enjoy. You can also freeze them and reheat when you are ready to eat.